So beautifully captured, Simon. The Plymouth eLearning Conference was an amazing combination of things: open, informal and full of laughs, as well as intense, reflective and thought-provoking. I just about wrote and drew my way back to Galway… ideas, plans, mind maps. Ready to roll! It was, indeed, a privilege to spend time with so many people hopeful and blazing with energy about the future of learning. Steve Wheeler hosted an event which featured stimulating speakers and workshops, yet allowed time and comfortable spaces for conversations and connections to happen. I pay great credit to Steve and the talented team behind this event; the conference organisation was flawless. Somehow Plymouth even flaunted perfect summer weather (in April!). Stephen Heppell set the tone in his keynote, describing himself as “more optimistic than ever” and calling this generation of newly-qualified teachers “the best I’ve ever seen”. He gave numerous, (literally) mouth-watering examples of student-designed learning spaces and student-led learning , e.g. creative seating, all walls as whiteboards, even classroom ovens for baking bread. Heppell inspired and challenged us, saying that this generation will astonish us with their learning — but only if we astonish them with the best possible learning environments. John Davitt, playing with the concept of the keynote address, gave a talk which inspired, provoked and delighted. He reminded us that when learning is new and difficult, each of us walks a different path. Activity is key — so as educators we must seek to turn activity “from an afterthought to an artform”. I think this is a great challenge for higher education, particularly, where it’s easy to allow tradition and procedures to constrain us. 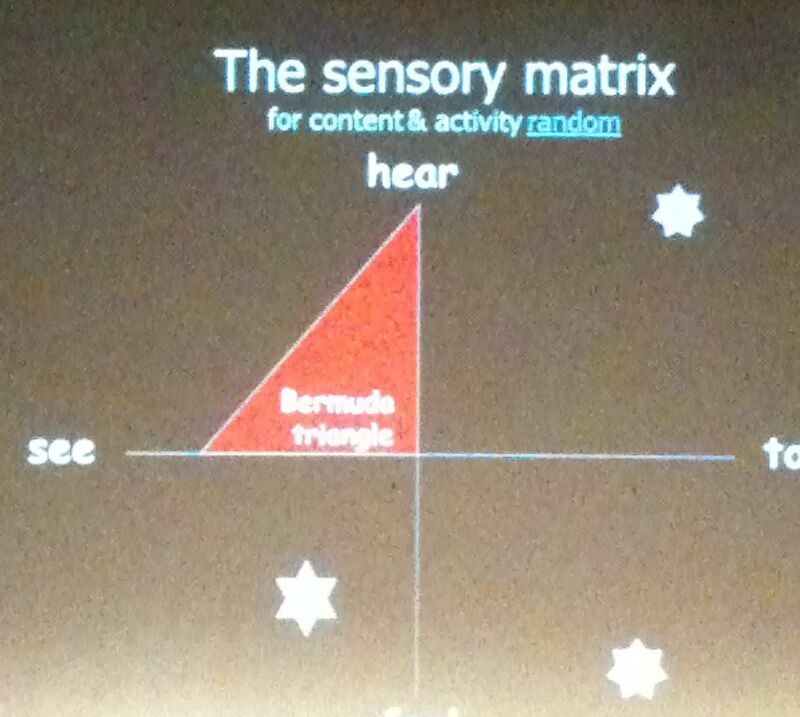 Using the 4 axes of the sensory matrix: see, hear, touch and feel, John warned us to beware the Bermuda triangle of teaching. He demonstrated his RAG app, a Random Activity Generator for generating new ideas for learning activities — do check it out. Davitt concluded: “let’s celebrate our own learning curve”. The future of learning is open and connected. Twitter continues to be a powerful tool, connecting learners across boundaries of sector, geography, culture. John Davitt gave the best definition of Twitter I’ve yet heard, describing it as a tool for “anarchic learning and peer support”. The Twitter backchannel during the conference (#pelc11) was a non-stop reflection and discussion of what was happening in the lecture theatres and beyond, with people sharing ideas, resources, questions and criticisms. Thanks to Twitter, this communication was real-time, open, raw. Educators tuned into the conference from far beyond Plymouth, contributing and interacting. When Stephen Heppell described great education as being “collaborative, collegiate, unstructured and global”, he was describing what we were doing at PeLC. How could we not offer this opportunity for great education to our students? In numerous sessions, the call for mobile, open, connected learning was made. Conference contributors — including the wildly enthusiastic trainee teachers who presented at the TeachMeet (#tmpelc11), encouraged by the irrepressible @chickensaltash — shared their experiences of using Twitter, Facebook and blogging with their students. Let the students choose their own tools. These forms of public and connected writing can help students to develop academic literacy skills which go beyond basic writing skills to include reflection, online networking and giving and receiving feedback. School leadership must be brave and embrace openness. We are moving in the direction of more mobile, sharable devices and less single-focal-point classrooms. As Stephen Heppell said, we live in a world of transparency; we just haven’t embraced this in teaching yet. More change will happen in education in the next 10 years than in the past 100. But very few at the Plymouth eLearning Conference doubted Heppell when he concluded his keynote: “the next decade will be the best in your professional lives”. Excellent! Your 6th paragraph expresses so clearly something that I want to get across to my boss in my report on the conference. Do you mind if I quote you?